Happy birthday mom! We have had quite the times in this shared 11 years that have passed by, the only times I have had to share! Remember all of those times we had? All the laughter that was shared? Like, last year when we were on a shuttle bus going through Philly and it took us around 3 hours to get home? And when Dad started freaking out at a Pizza Hut and picked up the seat? That was fun. It is just… just… no words will come out to come a tad bit close to describing what it is like to be the heir of you. Lack of words are coming out of my mouth to describe it, but in the good sense. I wouldn’t be here, mindlessly typing away at the computer if it weren’t for you and your ways. You just have a keen insight on the universe and the people in it that you can’t find in anyone else on this earth. Uniqueness is the word to describe it. If you even dare to ruin the surprise and open your email inbox, I take back EVERYTHING THAT WAS JUST SAID!!!! You are as amazing as this display of sock monkeys that I made with the magic of Photoshop and Google Images. THEY WILL TAKE OVER BEFORE YOU CAN TAKE A CHANCE WITH BLOWING OUT THE CANDLES!!!! Age is just a number… actually it is a word, but I just stole that off of a meme. Don’t think that you are getting older but that you are getting more used to the universe, getting wiser, and being more you. More shared moments, more laughter, all of that funneled in to your mind. This morning Marshall woke me up and told me that we were going to the Happy Hippo toy store to get a LEGO set called The Lion CHI Temple. We went there and he grabbed it like he knew where it was from heart. Then I looked around for something and I found a Magic 8 Ball. I asked it if I wanted to get it then shook it and it said “My sources say No.” IT was hurtful but I decided to get it anyways. It felt like it was really calling out to me, so i bought it (so did the 5 fart bombs, so i got them too!) I asked it when we got in the car “Was buying you worth it?” it said “Outlook not so good.” It basically said that it would have been better off in the store. Later I started asking it questions. First i asked it “Is Ross Lynch’s hair fake?” It said” Without a doubt.” Then I asked it “Will good fortune come in the future?” It said “Outlook not so good.” Then I asked “Was there a time in the universe where hot dogs were actual dogs?” It said “Better not tell you now.” In case there was a time where hot dogs were actual dogs, it would look like this. So I learned something today. I was asking a ball for advice… Now I’m really embarrassed, but I still like the ball. And also, Fart bombs don’t lie! Okkkaaayyy. I remember thinking how great that was on the day I actually wrote it, and literally fell in love with it even though I look back on it today and cringe. But, for the re-written part, shan’t we begin? ON THIS PARTICULAR MORNING, my over the top brother shook me out of the bed while I was binge watching Bob’s Burgers but I was asleep. Yeah, it’s a condition, when while you sleep, your sleepwalk over to the remote, turn on Netflix and turn it on and continue to sleep while listening to it. I have to suffer through it. Marshall couldn’t make sense of anything, and just gabbed his fast-paced gibberish. I blinked, trying to wake up and make sense of what was going on, and when I realized that Marshall was just being his regular self, I laid back down and went back to sleep, but before I could close one eyeball, Marshall shook me back out and screamed, “WE ARE GOING TO THE HAPPY HIPPO TO GET ME, MARSHALL A LEGO SET NAMED THE LION CHI TEMPLE BY LEGO!!! !” I felt betrayed. 7:00 o’clock in the morning, and forced to go out to a cheesy toy store in Haddonfield. But, there was no stopping it when the motor has already started running. So we took off. When we entered the store, the brother that I no longer know ran up and grabbed the set like he new where it was from heart. Then, I looked around for something and in all the curiosity, I found a Magic 8 Ball. To dust away the mysterious physique of the situation, I asked the question burning in my mind. “Do I wish to get you?” In all the anticipation, it replied, “My sources say no.” I asked in reply, “Should I get you?” The ball abruptly replied, “No.” I asked to follow it up, “Do you want me to get you?” In all of its circular-ness, the ball responded, “No.” I felt like it really wanted just to stay on a dusty old shelf in a store named after a hippo, but it cannot really stop me, so I bought it anyways (as did the 5 fart bombs). We got in the car, and I decided to ask it questions to start it off. “Did you ever go camping?” “Cannot predict now.” “Do you like cake?” “Cannot predict now.” “Do you feel good about curtains?” “Cannot predict now.” What the?…. Was it broken? Was it stubborn? Because it wasn’t responding to me!!!! I was unimpressed. I was promised magic!!! All I got was a cheap ball that wouldn’t even answer the deepest questions of the universe!!!! There was no magic involved in my purchase!!!! NONE!!!! I asked it a few more questions to prove my hypothesis, but still, it would not budge. So, I believe that I learned many things today. Number one. I INTERROGATED A BALL!!! Within the depths of this morning, we decided to go to a place deep in the Pine Barrens called Wheaton village. It is a glassblowing village. Going to a glassblowing village was about as exciting as going to the Adirondack Chair Museum. The car ride was supposed to be long and I was so annoyed about that, but it only took like 30 minutes. I brought the Magic 8 ball with me in case we needed it. When we got there, Marshall was having an Aha moment and he was remembering his field trip there. When we went in he was our tour guide and showed us around. The glass museum was sort of like the TARDIS. Bigger on the inside. The worlds largest glass was in there. It was HUGE, like 6 ft tall! We walked around for a while then went to a glassblowing demonstration. It was really hot in there, and the announcer was only really talking about what one of the glassblowing people were doing, and the other one was chopped liver. I hate it when people say chopped liver. Like, imagine if someone chopped up someones liver. Doesn’t eating liver make you a cannibal? Anyways, we left because it was too hot in there, then went to the general store. I saw something called a Jersey Girl bar, and wondered why people make fun of New Jersey. A bunch of famous people like Thomas Edison and Stephen Spielberg lived here. I got duck lip balm, a Smartie lollipop which i called the stale Smartie, and bottled water. Then we left and went to Chick-fil-a. I brought the Magic 8 ball in and ordered my meal using it. So i got a chicken sandwich and a water. Then I used the ball to find which seat to sit at. It said no to all of them so i ended up just using a seat that it said no on. Then a person sat in a seat that it said no on and i asked the ball if that seat was cursed. It said yes. Just telling you, I’m not dumb, I know that seat was not cursed. When we got home I downloaded a Hogwarts map for Minecraft. I played on it and it was like, an exact replica. Then later we went to roast marshmallows at my friend Lucas’s house. It was fun until my marshmallow CAUGHT ON FIRE AND I RAN AROUND SCREAMING THE MY STICK STARTED BURNING SO I THREW IT IN THE FIRE! The marshmallow died. And then after a few more sticks being burnt and several more marshmallow meteors we went home. Today was a bit agitating, fun, fearful, and exciting, so I guess it was a pretty good day! Wow. I am just… wow. So I guess I have to re-write that. The way I would today. Great. Ok, and here I go. Within the depths of the awakening morning, our family gave a ‘why not’ and decided to go take a trip down to Millville in the Pine Barrens called Wheaton Village. It is a glassblowing village, whatever that is. Going to a glassblowing village was about as exciting as taking a trip in a PT Cruiser to the Adirondack Chair Museum. That would be unfortunate. The car ride was supposed to be a long one so I decided to settle in for the long one, so I brought the famous Magic 8 Ball to fiddle around with. But the car ride was only about a half hour, and we were there before you could say “how long was that?” When we got out of the car to an open field, Marshall twirled around while looking up in the sky, in the midst of an Aha moment reminiscing about his field trip that he had previously. After we shook him out of the trance he was spellbound by, he chauffeured us to the entrance, and we ‘graciously’ thanked him for that. The village itself was cute. NO ONE LIVED THERE THOUGH. IT’S JUST THE NAME. There was a whole row of adorable cottages with lots of glass. Too much glass to my liking, actually. We approached a big building, which apparently was the glass museum. A year ago I guess I referenced this building to being like that TARDIS from Doctor Who, a reference I wish I could leave out, but, being the nostalgic oddball I am, I’ll include it. The building was like the TARDIS. Bigger on the inside, but in this case, smaller on the inside and bigger on the out. We waltzed around the interior, and then saw the WORLD’S LARGEST GLASS!!! It was colossal, enormous, extensive, gargantuan, giant, gigantic, humongous, immense, behemothic, vast, monumental!!!! The family of four skipped nextdoor over to the glassblowing demonstration. It was hot in there, so hot it would make a guinea pig sweat! They don’t, which is a key piece of information here. There was an announcer who was dressed up all sweet and snazzy, but the joke was on him since he seemed like he was about to pass out from a heat stroke or something. But, what probably was a sign of it, all the announcer was doing was focusing on one of the glassblowers, and the other one was a hot steaming freshly made plate of chopped liver. But, doesn’t eating liver make you a cannibal. Even though it is animal liver, that is still disgusting. Has there ever been someone whose favorite food is liver, but they never admitted it to anyone because they were afraid they would get known as the person who enjoys eating animal organs? Anyways, we left because it went from being hot to sweltering, so we toddled over to the general store. I saw a little something in there called a Jersey Girl Bar, and that provoked a thought. Why would people make fun of New Jersey? If we are the armpit of America, I hope we brag to other countries about our armpit, because even if we are an armpit, we are one gorgeous one. In the store, I bought a duck lip balm, and a Smartie lollipop (which I blatantly dubbed the Stale Smartie). Then we left and went for a late lunch at Chick Fil A. I brought the Magic 8 Ball in with me, and ordered my meal using it. So, I ended up getting a chicken sandwich and a water. I used the Magic 8 Ball to find my seat. I asked its mythical-ness which seat was cursed and which one was not. It said no to about all of them expect for one two seated one. We decided that our parents would sit in the cursed ones and the both of us would live. Afterwards, we arrived back at home. Lucas called, and invited the both of us to roast marshmallows. We climbed over the fence and saw that his dad REALLY lit the fire up. I guessed he used about a gallon of gas to vamp that fire up to where it was. So, we grabbed out sticks, grabbed our marshmallows, and set them out to roast. I dared myself to dip my marshmallow right in to the fire, which only SET THE MARSHMALLOW ABLAZE!!!! I RAN AROUND WILDLY UNTIL I JUST THREW THE STICK IN TO THE FIRE!!!! It died. Spoiler Alert. I firmly believe in the spoiler alert after the spoiler alert, just so you know. And then after a few more sticks being burnt and several more marshmallow meteors, we went home. Today was a bit agitating, fun, fearful, and exciting, so I guess I could call today a pretty good day!!! Thank you for reading Day 1 out of 10 for the Blogoversary Countdown!!! Please join me again tomorrow for the others!!! Goodnight!!! Very Special Things That You Have To Read Now! I know. I’m a verrrrrrrry nostalgic person. At the age of 11. And that fact that I am 11 means that I don’t have much to nostalga-ize about except maybe a few little things when I was little. But I somehow find a way. Anyways, if you are thinking about the post I made a month or so ago about my blog-o-versary, and that it was bizarre that I am making another post about it after it had past, that was my ACCOUNT blog-o-versary! I am making another one because this is the one for this blog. In favor of this very special occasion, I will count down the days (starting tomorrow) to the day by re-writing the way I would today the first 10 posts. And I will include the original at the bottom. The first of ten posts will be up tomorrow. So, I will say more words in about 24 hours exactly. I’ll just remember that the time it has to be up tomorrow is 8:03 PM. CHEESECAKE!!!! Happy Birthday Scott Colan (or Dad)!!!!! Dad, like Channing Tatum’s face imprinted on a poodle, you are amazing. And almost (almost… sorry) as amazing as He-Man singing “What’s Going On” by 4 Non Blondes. I mean, even though I have tried to pin off your birthday as my own since I still technically am you because you made me and we have the genes of the other, I still respect you as the man standing before ME TODAY READING THIS BLOG POST BEHIND MY BACK! HI DAD!!! ENJOY THIS BIRTHDAY SURPRISE I’M WRITING YOU!!! UNDERLINE SURPRISE!!! ALSO, THIS DOUBLES AS YOUR PRESENT! I WAS GOING TO GET YOU SOMETHING NICE FOR YOUR 49th TOMORROW, BUT IT REALLY LOOKS LIKE YOU WOULDN’T APPRECIATE SOMETHING LIKE THAT! YEAH, RUN AWAY DAD!!! Sorry that you had to indulge in that conversation, but he was looking over my shoulder as he always does and HE PICKED THE WRONG TIME FOR IT!!!! Gosh. It’s funny. That’s the point. It’s funny so it can distract him from the fact that it was the cheapest thing in a store that sells nothing but satirical mugs that I don’t think even a rich bloke could afford without forcing his family to go through a second mortgage. And also we got it on the only spare time we had that day, which was during my brother’s guitar lesson, other than the 5 hours of free time we DID have but we spent playing Minecraft and watching reruns of Seinfeld. Poor Elaine’s fish. You’d get that reference if you were there. But it only really is the thought that counts. The thought that birds flock together and crap on your car, I guess. But, even though it took me about 324 words to get to it, no 330 words now, 332, yes 332 words to get to the point, DANG IT now it is 344 words, now 346. Happy Birthday Dad!!! Even though, in reality, the birthday is nothing more than a satirical plaque that will probably find itself untouched on a dresser a day from now, and a bunch of freaky cone-shaped hats with plastic bands that chafe at your chin, and a German chocolate cake (always German chocolate, and I don’t want to hear ANYONE disagree), I think the thought and the day is a pretty darn good one. I mean, 49 years ago you were brought in to the world. Wouldn’t it be really funny if it was the 49th of July right now and you were like turning 49, that would be so funny, no there is no 49th of July WHAT THE HECK!!!! I mean, there is so much to thank you for right now dad! For bringing me in to the world, for being forced to indulge hard labor in a laborious office from 8:00 AM to 6:00 PM while I selfishly whine about getting the next 50 dollar ripoff hunk of junk that I found at the Homegoods store (even though everything there is perfect, and I didn’t want to say Toys R Us because I morbidly despise that deathtrap). FOR GETTING ME TO TRY GARLIC KNOTS!!! I wouldn’t be here right now, typing at this blog post, if it weren’t for you. For two reasons, actually, one because you taught me all you knew, and I literally wouldn’t be here if it weren’t for you! Today, I’m giving a BIG hearty celebratory sign of appreciation to Jim Kenney, who managed to win the spot of the democratic nominee for mayor! And, I am willing to say that I only increased his chances of winning by 37%, multiplied by two. That’s the Charlie Colan pact; I interview you and your chances of winning the spot of democratic nominee are 37% or the money you didn’t pay back! The city of Philadelphia has a big decision to make in the next few days; they have to choose who will lead the city. Now, I have had the opportunity to do an email interview with the man who I am biased to say that will be mayor, Jim Kenney! Alright, now, I have sent this man 6 questions that will help explain what he will do to fix the city of Philly, and I now see why he seems to be the head of the race so far. While writing this, I did have a little help with the questions. And, I hope you enjoy it! 1.) Being mayor looks like a thankless job. People are always yelling and screaming and upset with decisions that the mayor makes. So why did you decide to run for mayor? When you are the one making tough decisions you’re not always going to please everyone, and as a City Councilman I’ve had some practice with this. I always remember that it’s a few people who are unhappy that make the most noise, as long as it’s a net benefit to the city, it’s usually worth it. I believe that you’re never truly happy unless you’re serving others, by high school teachers taught me that. As mayor, I think I’ll be in the best position to drive down the city’s poverty rate and help the most number of people. 2.) Fixing the schools is important because children are the future. For years, people have tried to fix the school system and failed. What makes you so sure that you will succeed where so many have failed? My approach is different because I’m focused on expanding community schools – which address the child’s entire learning environment, including the family’s socio-economic circumstances and the child’s health. Community schools are proven to raise graduation rates and improve the communities surrounding them. 3.) When Lynn Abraham fainted on TV, people who saw it said that she should drop out of the election because she was too old. Other people said this was sexist, because they wouldn’t do the same if a man fainted. If you had fainted, do you think people would have suggested you drop out of the election? Also, what does sexist mean? Sexism is when women are treated differently because of their gender. For instance, many women are paid less than men despite having the same qualifications. As mayor this is something I have a plan to correct in Philadelphia. As for DA Abraham, I think she’s proved that she’s as fit as a fiddle. 4.) I am worried about getting shot by the police. Do you think that every police officer that has a gun should have body cameras? I do believe that every officer carrying a firearm should be outfitted with a body camera that way any time there is an accident city officials will know exactly what happened and will be able to react accordingly. 5.) I’ve heard that the city’s pension fund should have at least $10 billion in the bank to cover everyone, but we only have $4 billion saved. When I grow up, if I worked in the city, would you say there would be a pension for me? There are three things I will do to make sure our pension fund is solvent and available for future generations, including overfunding the city’s minimum obligation, negotiating with municipal unions and revising our agreement with the Wall St managers who currently receive $32-33 million in fees every year. 6.) If you become mayor would you make a law saying that the Eagles can spike the football after a touchdown? Unfortunately, that is something that falls outside of what I will be able to do as mayor. That is something that will be need to be addressed by NFL commissioner Roger Goodell. All I can say is that I hope we as fans can celebrate plenty of Eagles touchdowns in the stands and at home. On August 6, 2014, little did I know that I would be able to go this far with writing, for I only just started writing on WordPress. Well, I did, and instead of only having one post on this blog, I now have 100! I can’t believe that. I expected this entire blog to fall in to an abyss full of hopelessness and despair, and there were a couple of times when this blog fell in that abyss. But, I managed to climb out of it, and the outcome was wonderful. I have put my heart, soul, and tears in to making this whole thing work, and I couldn’t be any happier. I can remember myself thinking that I wouldn’t make it past 5 posts without just giving up, but now I can only laugh at the thought, because now I’m at 100! To make absolutely everything clear, of course I want a whole lot of views, follows, and likes on this blog. I get excited from spam comments; they make me more happy than an elephant would be if they got a big old bucket of peanuts. So what? At least I got this far. This is my moment. In the beginning, it really was a stupid, childish thought that I would get remotely close to reaching 100 posts. I worked, cried, and pushed myself that far, and I can only agree with myself back then, because it is, a stupid, childish thought, reaching 100, that is. But that’s what makes it so special. This is my writing. I got this far doing what I love to do. And I think that that is an achievement by itself, being able to love what you do enough to take it to the next level. That even though it is unbelievable, I did it. And yes, I am aware that many, I repeat, many, other people have gotten to 100, but at least I did. And, to me, that is all that counts. I mean, this all has been a journey. A tough, long, somewhat horrible journey. But, I climbed to the top of that mountain. I punched doubt in the face during the times it bugged me. And after all of this time, I can still remember what I was thinking when I published my first post on the blog. Of course I was nervous; I was putting my voice on the internet, where there was no privacy, and everyone could see my writing. I was afraid there would be hecklers, and meanies, and BEARS! Oh, the thought of bears. But, when I pressed that button, relief washed over, and I felt, well, good! The pushing of the button gave me a chance out in the real world; the chance to make my small, little voice heard. And I did. The relief of that button-push came to me 98 more times, hopefully more incoming. You know, I think the thing that made me stick through all the madness was just two words; What if? What if I keep going, and strike gold? What if I stop, and leave behind my life and soul? If I publish a post, what if it goes viral, or gets Freshly Pressed (not that I’m asking for that, though I have been hoping)? All of these questions inspired me to stick with it. They molded me in to the person I am right now. Now, if I look back to myself, thinking that question while I published my first post, I would answer saying that the answer revolves around myself being myself. I would tell myself that I have to stick with it, and I guess good would come out of it. Well, I guess good did come out of it. And, to be honest, I couldn’t be any happier. I did it! For an entire month, I posted every day, and didn’t cry at the keyboard as many times as I thought I would! Now, terrible memories, and some good ones will stir my mind whenever I think of November for the rest of my life. After all that happened, one thing struck me: I am never doing NaBloPoMo again. I guess it was fun, but it caused me too much pain to do it again. I survived, though. To make it even better, all of the posts were exceptionally long ones, to be exact. All of them were more than 700 words, some more than 1500 words. So, now I can say without making myself sound odd, I DID IT! Though, I did encounter one problem. When I published my Universal Studios post, I looked at the blog calendar, it said I published the post on the 16th, instead of the 15th. So later I found out that 7:00 was apparently midnight to WordPress. Yes, I am aware of time zones, and I don’t need anyone, I repeat, ANYONE, to comment about that. So, it says that I didn’t post for two days, because I posted late at night. WHICH ISN’T FAIR! And even though I’m celebrating about completing the most brutal experience of my life, this one thing keeps coming up and bugging me. I read a post on the BlogHer NaBloPoMo central called “How NaBloPoMo Feels… In 16 Pictures.” I read it, and it was all wrong to me, because I feel the exact opposite. There was a little more complete sadness in my experience, and annoyance. I thought I was going to feel terrible at the end, but, instead, I ended up feeling happy. Incredibly happy. So happy, that if I didn’t extinguish the fact that I was happy, the whole world would collapse upon itself, then a vast cloud of happiness would poison everyone and they would die. I’m also glad I didn’t resort to small posts, because I don’t really like those. Well, I don’t really like my style either, but by now, you get the idea. I know most of this months posts were boring, but to be honest, at first I was enjoying myself and actually writing good, then I just let myself go, and just wanted to get it over with. Like a thing that comes to haunt me daily, and I can’t get rid of it until it’s over. But now it’s over, so I feel good. By good, I mean good that I got it over with, not good because I posted every day for a month, and live to tell the tale. Not good because I wrote mostly exceptionally good posts. Well, I guess I should stop insulting myself about it so much, although I don’t want to make myself sound like a high-classed snob. 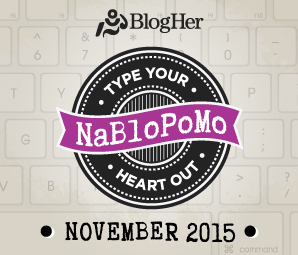 Though I do know that I have completed NaBloPoMo, and it has been quite an experience. I met new people on the internet, got my first re blog, got many more followers, and most importantly, got better at writing. Actually, most importantly I got more followers, you know what, I don’t care. I’m off to take a little break from blogging. My next post could be tomorrow, or in a week. Who knows, I’ll do whichever comes first. I’m out. Recently, I did a post about all the Halloween jokes I have heard. Now, I’m looking at Thanksgiving, and I thought I should do another post, but this time about Thanksgiving jokes that I took from the internet. Thanksgiving is placed at the worst time of year. It is wedged between the two most popular holidays, Halloween and Christmas. So, to pay my respects to this holiday, I present to you, The Complete Thanksgiving Joke Compilation! Enjoy, I hope you get Santa Claus-traphobia! Oh wait, that is a Christmas joke, DANG IT! Q.) Why does Santa have three gardens? A.) So he can ho ho ho. Oh wait, Thanksgiving jokes, not Christmas. Sorry about that! Q.) What is a pilgrim’s favorite type of music? Q.) Why do pilgrim’s pants always fall down? A.) Because the belt buckles are on their HATS! Q.) Why did the turkey cross the road? A.) It was the chicken’s day off! Q.) Who is not hungry on Thanksgiving? A.) The turkey, because he’s already stuffed! Q.) What is the key to a good Thanksgiving dinner? Q.) What do you call it when you drop a turkey from a helicopter? Q.) Why did they let the turkey join the band? A.) Because he had the drumsticks! Q.) Why did the police arrest the turkey? A.) They suspected it of fowl play! Q.) What country ironically does not celebrate Thanksgiving? Q.) Why can’t you take a turkey to church? A.) Because they use FOWL language! Q.) What did the baby corn say to the mommy corn? Q.) What would you get if you crossed a turkey with an evil spirit? Q.) What comes at the end of Thanksgiving? Q.) What do you wear to Thanksgiving diner? Q.) What happens when a turkey gets in to a fight? A.) He gets the stuffing out of him! Q.) What happens when you divide the circumference of a pumpkin by its diameter? A.) You get pumpkin pi! Q.) What key won’t open any door? Q.) What did the turkey say to the hunter? Q.) What are unhappy cranberries called? Q.) What is a turkey’s favorite desert? Q.) Why do potatoes make good detectives? A.) Because they keep their eyes peeled! Q.) What is the best thing to put in a pumpkin pie? It’s the day before Thanksgiving, and the butcher is just locking up when a man begins pounding on the front door. ‘Okay, ‘says the butcher.’ Let me see what I have left.’ He goes into the freezer and discovers that there’s one last scrawny turkey left. He brings it out to show the man. ‘That’s one is too skinny. What else you got?’ says the man. A small business owner was dismayed when a brand new corporate chain much like his own opened up next door and erected a huge sign which read BEST BLACK FRIDAY DEALS. He was horrified when another competitor opened up on his right, and announced its arrival with an even larger sign, reading LOWEST BLACK FRIDAY PRICES. The small business owner panicked, until he got an idea. He put the biggest sign of all over his own shop-it read… MAIN ENTRANCE. I hope you enjoyed! This was much easier then my normal posts, because actually being able to add someone else’s humor without being arrested is so much fun. Merry Chrism….I mean Thanksgiving. Happy Thanksgiving, I mean.. well, yeah. Happy Thanksgiving.